This multi-purpose Sriracha Hot chili powder is made from red chili peppers, garlic, vinegar, salt,sugar just like the original Sriracha Hot Sauce. Blended with freshly harvested and crushed 'Superhot' chili's. Sriracha Hot Chili Sauce flavor is unique, addictive, and wildly versatile. The Sriracha Chili Powder is hot and tangy with just a hint of sweetness, which sets it apart from all other varieties of hot chili powders. •Straight: Sprinkle your Sriracha onto everything. From popcorn, meatrubs, toast, cocktails, hotdog's basically anything you eat. You can mix some Sriracha powder with warm water, mix well and pour some into a small bowl then onto your favorite foods. •Sauces: Sriracha’s spicy, tangy flavor pairs wonderfully with creamy dips and sauces. Mix some Sriracha powder into sour cream, mayonnaise, or cream cheese based dips for a little kick. Put some into your favorite sauces for that extra flavour and chili kick. •Soups/Stews: Sriracha is often served with pho in Vietnamese restaurants but you can also try adding it to ramen, tomato soup, or gazpacho. Cream based soups, like chowders, also benefit from Sriracha’s kick. •Meats/Marinades: Add Sriracha to teriyaki flavored marinades, BBQ sauces, meatballs, meat loaf, or chicken wings. Sriracha and meat were made for each other. •Eggs/Cheese: Anything creamy, including cheese and egg yolks, balances perfectly with the spicy, tangy flavor of Sriracha. Add Sriracha to macaroni and cheese, cheese dips, cheese balls, or scrambled, fried, or deviled eggs. 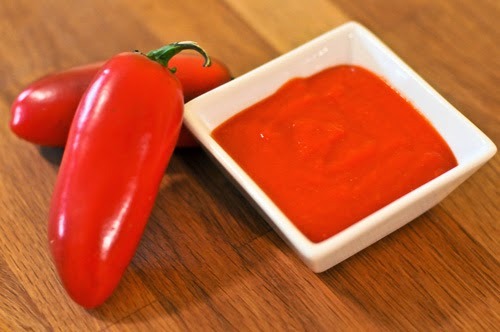 •Drinks: Sriracha sauce adds a new twist to Bloody Marys or to regular tomato or vegetable juice.